A wildfire in Santa Barbara, California, in June 2009 helped forge some unlikely bonds. Rescued from the Jesusita Fire, a three-week old bobcat kitten and three-day old fawn became fast friends. The animal rescue in California brought predator and prey together. But these babies simply took comfort in each other’s company, snuggling under a desk at a dispatch office for hours. 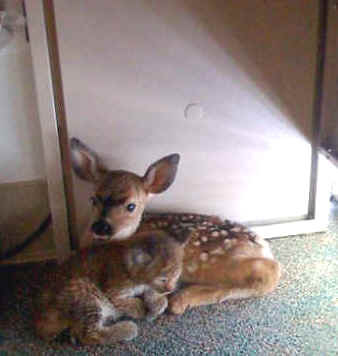 The bobcat and fawn would not normally be placed together, due to regulations, but the rescuers had no choice. They snagged the bobcat kitten first, finding it dehydrated and near death. Later, they brought in the fawn and discovered they didn’t have a crate large enough for it. 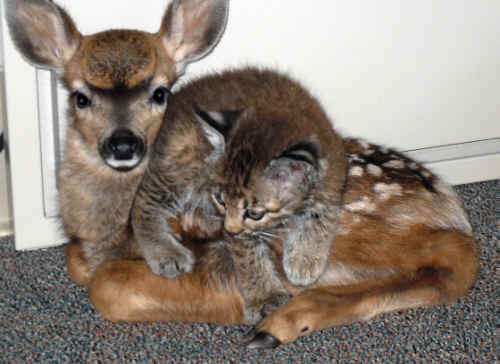 No matter - the kitten ran right over to the fawn, and the two became fast friends. Thanks to the tireless dedication of volunteer efforts of the Animal Rescue Team, and the Santa Barbara Wildlife Care Network, these two animals, and many others were rescued from the destructive Jesusita fire.